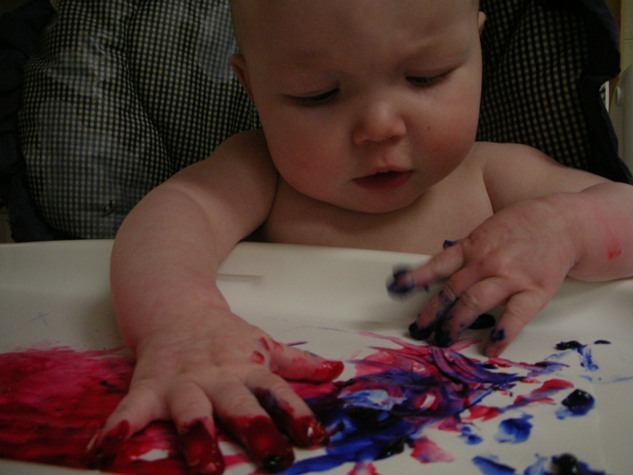 I love this picture of Lorelei the first time she got to play with finger paint…she just delighted in it. She had such a serious look of concentration as she mixed the colors. In so many ways, I wish I could create like this… to let go…to just explore what happens in the interplay of colors and textures. I’ve put this picture on my inspiration board to remind me to just play sometimes. I picked up The Artist’s Way: A Spiritual Path to Higher Creativity by Julia Cameron on a recommendation, and I would highly recommend it to you all as well. I have stopped at points almost in laughter and in tears as she describes the various creative blocks I have been struggling with. It is truly eye opening for me as I read this book that I am not alone in my thoughts and that others have struggled as I have. She also offers some concrete ways to break through and just create, and I am excited to pursue those. One of her first recommendations is to begin a journal of sorts where you can give yourself permission to just let go and not judge what you create, and play with new techniques that you might otherwise be afraid to use or learn about. Lucrecer Braxton is beginning an art journal group within the next few weeks (and she has some amazing ones, I might add) that I am definitely joining- stop by her blog and check it out. I also have found the books/journals by Sabrina Ward Harrison incredibly inspiring…reading hers has given me the permission in my head to just explore where I am and where I am going. So how about it? Would you like to play with me today? She is so cute!!!!!! !i love the picture so girlie!!! Love this! I just read Rebecca Sower’s blog and saw your comment so I had to pop over and see what you’ve been saying on the subject. Yes! Let’s PLAY today!! Thanks for the encouragement and book recommendations!